A year and a half since it hosted an unforgettable UIPM Laser Run World Championships, the iconic destination of Cape Town welcomed UIPM’s fastest-growing sport back to South Africa on March 9. 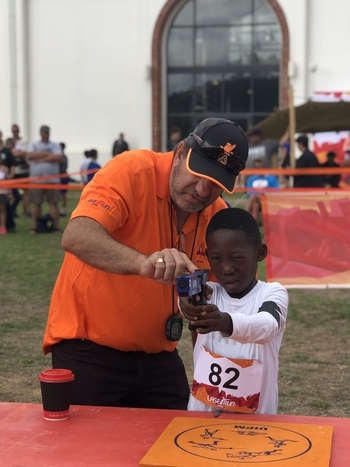 The ‘Rainbow Nation’ is one of the world’s most prolific countries in the development sports of Laser Run, Biathle and Triathle, producing young talent in great numbers – and many of them have now experienced the Global Laser Run City Tour phenomenon. The event on March 9 was hosted by the Western Province Modern Pentathlon Association in the Durbanville region, 25km from Cape Town. 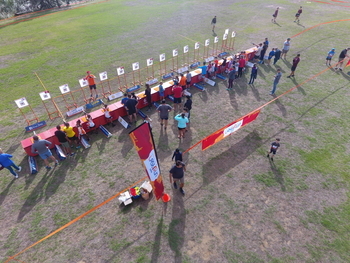 More than a hundred people participated, with some travelling as far as 400km to get the chance to hone their Laser Run skills in a competitive environment. It was the second GLRCT to take place in Africa in 2019, after the season-opener in Alexandria (EGY). A spokesperson for the local organising committee said: “The venue was turned into a festive atmosphere with music, the UIPM Laser Run event dressing, a course set up with bright orange and red colours, tents, and food vendors. “More than a hundred athletes across different age groups competed in the event, with a pleasing majority in the younger age groups. “Also encouraging was the participation of newly-interested young athletes to whom we could introduce the sport of Laser Run. Many of these athletes are development athletes from the various schools in the area, which forms a platform for the growth in the sport of Laser Run. “The highlight of the day was the joy on the younger athletes’ faces when presented with participation medals after completing their races.